Australia’s politicians stood up and took both bows and bruises for their stance on the Iraq war. John Howard promised he wouldn’t recant on the Iraq war, just as he wouldn’t recant on Vietnam. He’s been true to that pledge. Labor’s leader at the time of the Iraq war, Simon Crean, got kicked brutally for saying that Australia shouldn’t follow the US into the conflict. Now Crean’s speeches look as prescient as those of Arthur Calwell’s in opposing Vietnam—and politically, of course, taking those stances helped to damn both Crean and Calwell. Being right too early in politics can be as damaging as being wrong. To go back down the time tunnel, here are the Iraq war speeches made by Prime Minister Howard and Opposition Leader Crean when Parliament assembled in February, 2003. Howard had the numbers on the day but Crean gets history’s vote. Kevin Rudd had the fortune to be able to pin the Iraq war on Howard when the scale of the disaster had become apparent. Rudd could argue that Iraq was the wrong war: Australia would withdraw and concentrate on Afghanistan. Rudd’s case was that Australia could exit Iraq but hold firm to the US alliance. Issues of security and war helped deliver two election wins for Howard but that strong leader mantle eventually became a burden. The 9/11 attack was a significant element in Howard’s election victory in 2001 and the Iraq war was still a plus for Howard in the 2004 election, where Mark Latham’s anti-US stance was a vote loser. By the 2007 election, though, Iraq delivered for Rudd and helped define Howard as yesterday’s man. The leaders spoke and the voters decided. Issues of war and peace were central to those three elections of 2001, 2004 and 2007. By the 2010 poll, Iraq and Afghanistan hardly featured. Australia and its leaders turned inward. Setting out the sequence like this is at odds with the headline to this piece—‘the Canberra silence’. But ‘silence’ isn’t a reference to our politicians and certainly not to those elections. For good or ill, Australia’s leaders stood up and argued their case and will be judged on their words and deeds. The silence I’m referring to hangs over a number of buildings that sit within sight of Parliament House. The silence is that of the public service, then and now. Ten years on, one of the continuing mysteries of the Iraq war is how little influence the Canberra system had on the Howard Cabinet decision to go to war. There was no big debate or argument inside the bureaucracy. Virtually no paper was produced on the prospects or the dangers. There’s no paper trail leading from the bureaucracy to Cabinet. Howard didn’t ask for it. Thus, he wasn’t given it. Not asked, the bureaucracy didn’t speak. And that silence endures. Howard acknowledges there was no cabinet submission on the costs and benefits of going to war in Iraq. The Department of Foreign Affairs and Trade was not asked for, and did not offer, any advice on the pros and cons of supporting American intervention. This reinforces the view that Howard’s decisions on Iraq were political, not based on a dispassionate appraisal of the threats it posed. Here is the modern version of our system. Frank and fearless advice is not an automatic requirement. If the Prime Minister has made up his mind to go to war, then don’t give him contrary advice. Certainly, don’t give him advice he hasn’t asked for. And beware any senior bureaucrat who produces paperwork that could be leaked to attack or discredit the commitment to war. A submission that doesn’t exist can’t be leaked. The levels of silence and sophistry in all this are myriad. One key point is that right up to the moment the guns started firing, Howard maintained that Australia had not made up its mind about whether to go to war. His statement to Parliament in February 2003, repeated that the government hadn’t made ‘a final decision to commit to military conflict’. The public position was that this was a government wrestling with all options, still to make the ultimate call. Strange, then, that a government agonising over such a choice asked no questions of its senior advisers. The reality is that all sides of Australian politics and everyone in Canberra knew the commitment had long since been made; the Australian military was deeply involved in the US planning for the war and Australia was in. To his credit, Howard makes this clear in his memoirs, where he admits that all the public protestations about Australia having not made up its mind amounted to what I dubbed ‘The big Iraq fib’. There was never much question, or even debate, about Australia joining the US in the war.Australia did not keep its options open; it didn’t even explore the options. In writing about Iraq, Howard demonstrates that the necessary act of political will—the choice—at the heart of the alliance with the US can take on a rather automatic tinge. That’s what happens when the alliance is elevated from vital to sacred. The Canberra system has barely confronted its passive silence over the Iraq war. The 2004 inquiry into the Australian Intelligence Agencies by Philip Flood reported on ‘a failure of intelligence on Iraq Weapons of Mass Destruction’ (intelligence was ‘thin, ambiguous and incomplete’) but concluded that this failure wasn’t due to political direction. ‘The Inquiry found no evidence to suggest policy or political influence on assessments on Iraq WMD’. On a kind reading, this is a judgement that the agencies were guilty of group think and tacit willingness rather than an explicit direction to serve up what was required by ministers. The former chief of Army, Peter Leahy has tackled the Canberra silence by calling for formal Parliamentary ratification of a commitment to war, with that ratification to be renewed annually. Leahy seeks to lever the public service and the military more directly into the process by calling for ‘clear public statements of national interests and strategy’, setting out aims, means, an exit strategy and likely time frame. I’ve previously quibbled (here and here) about the political feasibility of the Leahy recipe (especially when the government rarely has a majority in the Senate) but he’s one of the few to have tackled the lessons for Canberra of the Iraq war and what it might mean for future conflicts. There’s not much soul searching evident elsewhere. 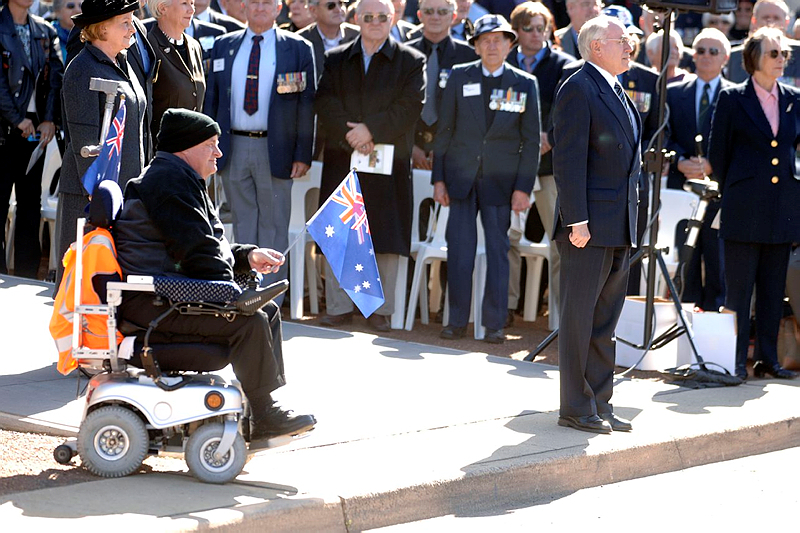 One of the harsh judgements that can be passed on Canberra is that this generation of public servants did a worse job of confronting the issues than did their predecessors during the lousy process that sent Australia off to Vietnam. The parallels between the politicians taking us to war in Vietnam and Iraq—with the public service standing on the sidelines giving a few cheers—are depressing. Consider the final sentence of volume six of the official history of the Vietnam War, Peter Edwards’ account of Australian Politics, Society and Diplomacy. His hope was that in any future commitment to war, Australians would show ‘greater political maturity, social responsibility and diplomatic adeptness than did some of their predecessors between 1965 and 1975’. Maturity, responsibility and adeptness? Canberra was silent then, and is still silent now, because in 2003 those standards weren’t met. Graeme Dobell is the ASPI journalism fellow. Image courtesy of Department of Defence.